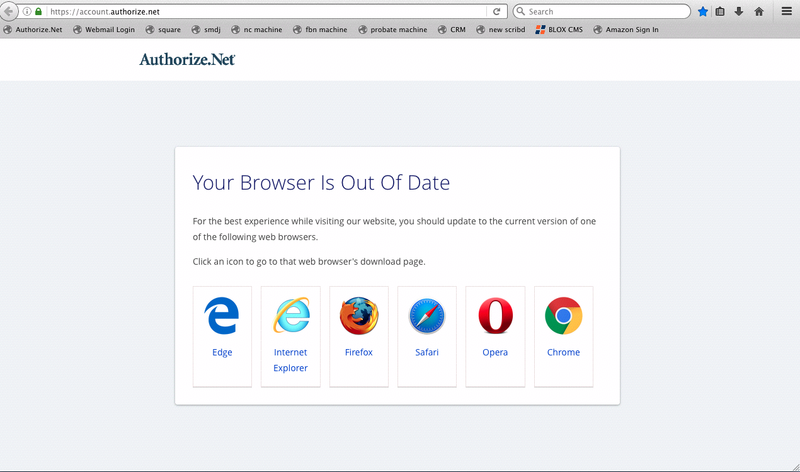 Recently, the site we use for credit card payments no longer accepts this wonderful browser. We have fully updated to release 7. Attached is a screenshot. Needless to say, this puts a big crimp in our efficiency as we have to turn to a separate computer for payments. Can anyone help figure out if this is something I can fix on my end? Change the User Agent string that TenFourFox reports itself as. It's under Preferences, TenFourFox. I changed mine to Firefox 52ESR (Intel), and I no longer get the "out of date" error. Others there may work also. You have to close TenFourFox and restart it for this change to take effect. You shouldn't need to restart it -- just reloading the tab is sufficient. Otherwise, yes, that's what the User Agent option is for. Always select the closest version in number that works (as you did here). I tried reloading the page, several times. It did not work. Closing and restarting TenFourFox was the only way I could get it to work. IAC, this problem is easily fixed. That did the trick! Thank you so much for helping us and contributing to this wonderful group. Cameron Kaiser closed this discussion on 10 May, 2018 06:55 PM.